“I love it when they boo,” may not be what you expect to here from someone starring in a pantomime. But that is what Sarah Johnson had to say about her part as one of the Ugly Sisters in Cinderella on Ice. “When I hear the audience boo and hiss then I know I must be doing a good job,” Sarah said. And judging by the amount of hissing and booing going on, she and Stacey Bullock, who played the other Ugly Sister, must have done a superb job. Playing a villain isn’t everyone’s cup of tea and Taryn Dennison certainly relished her part as heroine in the title role alongside Simon Waller as Prince Charming. It may not have been fair to cast Leah Rogers as Buttons, instead of Cinderella, but she played the part admirably. And they were not the only heros, as was pointed out by narrator, Ben Eltham, at the end of the final performance. Much praise must go to Charlotte Hester, 12, who skated solo and pairs programmes — including what could have been extremely painful lifts — with a broken thumb bone which she suffered during the final rehearsal. With no understudies, one might say she had no choice but to carry on and skate with her hand and wrist in a cast. But she deserves more credit than that, as does her partner, David Truby, who was 14 on the day Charlotte injured her hand. Helen Ingram, 14, deserves a pat on the back for the way she replaced Christopher Hockaday on opening night in the superb free dance with Rebecca Forsyth. Chris and Becca were inspirational, as were Richard Boaden, 16, and Tamsyn Pack, 14. James Bailey, 12, is worthy of praise for the enthusiastic way he took to performing on stilts which must have been far more difficult and dangerous than he made it look. As usual the show contained some excellent solos, duets and group numbers as well as some which were not so good, plus a mixed bag of choruses. Whatever happens in the future, the 2004 show prompted very good feedback and should go down in history as one of the better ones. Once again, club president, John Nike OBE, presented £500 at the last performance of the show to club chairman Roy Welham. This annual boost to the club’s funds is in recognition of the club’s contribution to the pantomime. And Mr Nike donated a further £5000 to the trust fund he unveiled two years ago to help create figure skating and couples ice dance champions. Although there is now £15000 in the fund, none has been spent because of legal formalities which it is hoped will be resolved soon. “The committee has various ideas on how this fund can be used to benefit those skaters that have the potential to become British Champions. There must be very clear guidelines set out before this can be embarked upon. If any of you has any ideas, please let me know as soon as possible in writing, in confidence if you wish,” Roy said. 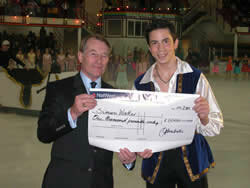 Mr Nike also presented a further £1000 to Simon Waller, 17, who he has been sponsoring for three years in his bid to represent Great Britain in the men’s figure skating event at the Winter Olympics. 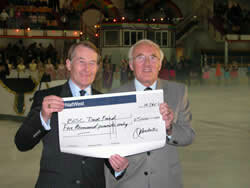 Roy Welham wishes to thank everyone who helped make Cinderella on Ice “a very successful pantomime”. However Jo McBride, who is responsible for licensing and registering skaters, has warned there could be problems next year if skaters’ relatives don’t volunteer to help. “Many thanks to all those who helped at the panto,” she writes. “All the children were well looked after and I hope they all enjoyed it. “With more than 80 children, it again fell on a small minority of parents to chaperone, many covering every performance. Without these people, your children would not be able to perform. We have to comply with local authority regulations and it is important for next year that we have more volunteers (mums, dads of grandparents) as many of the current chaperones will be standing down. “If you would like to help, please email me at jojomcbride @btinternet.com. There are other jobs which don’t involve looking after children but, even to help with makeup, you need to be police checked. This involves filling in a few forms, one of which is a criminal records check. This could take up to three months to process so it is no good leaving it until a few weeks before the show. And you may want to use it to chaperone at other venues where you might even be paid! You may be asked to undergo training which takes two hours and involves issues surrounding child safety.